NMR and LC-MS are two powerful techniques for metabolomics studies. In NMR spectra and LC-MS data collected on a series of metabolite mixtures, signals of the same individual metabolite are quantitatively correlated, based on the fact that NMR and LC-MS signals are derived from the same metabolite covary. Deconvoluting NMR spectra and LC-MS data of the mixtures through this kind of statistical correlation, NMR and LC-MS spectra of individual metabolites can be obtained as if the specific metabolite is virtually isolated from the mixture. 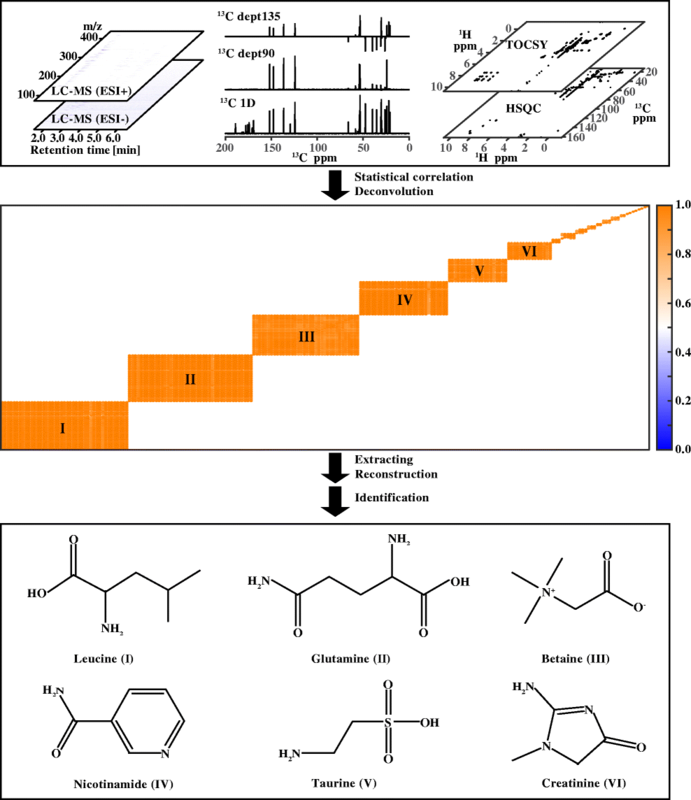 Integrating NMR and LC-MS spectra, more abundant and orthogonal information on the same compound can significantly facilitate the identification of individual metabolites in the mixture. This strategy was demonstrated by deconvoluting 1D 13C, DEPT, HSQC, TOCSY, and LC-MS spectra acquired on 10 mixtures consisting of 6 typical metabolites with varying concentration. Based on statistical correlation analysis, NMR and LC-MS signals of individual metabolites in the mixtures can be extracted as if their spectra are acquired on the purified metabolite, which notably facilitates structure identification. Statistically correlating NMR spectra and LC-MS data (CoNaM) may represent a novel approach to identification of individual compounds in a mixture. 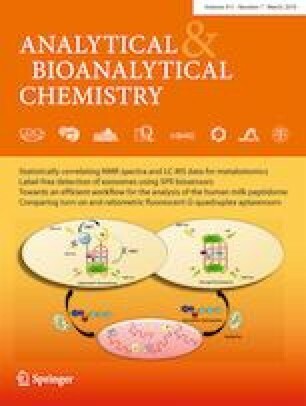 The success of this strategy on the synthetic metabolite mixtures encourages application of the proposed strategy of CoNaM to biological samples (such as serum and cell extracts) in metabolomics studies to facilitate identification of potential biomarkers. The online version of this article ( https://doi.org/10.1007/s00216-019-01600-z) contains supplementary material, which is available to authorized users. The authors thank Dr. B. Worley and Prof. R. Powers (University of Nebraska-Lincoln) for the help in processing 1D NMR-based metabolomics data with MVAPACK package. The authors also gratefully thank the group of Prof. A.S. Edison (University of Georgia) for providing the Metabolomics Toolbox. This work was supported by the National Natural Science Foundation of China (21505142, 21573258), the National Key R & D Program of China (2017YFC0906900, 2017YFC1700900), and Yunnan Provincial Science and Technology Department (2015FA028).